What Does It Mean When Squirrels Wag Their Tails When They Are Sitting? A squirrel's bushy tail serves many functions, from helping to keep him warm like a blanket in winter or cool as it shades his head in the summer. The tail also helps him balance as he climbs and jumps. When he's sitting still, however, wagging his tail means he has something to say and he's trying to communicate it. When you see a squirrel sitting still except for his wagging tail, take notice of what the squirrel might be focusing on -- it could be a snake. When squirrels encounter rattlesnakes, for example, they wag their tails and heat them up so the snakes' infrared sensors can see the movement. This shows the snakes that the squirrels are paying attention and plan to flee if the snakes get any closer. Rattlesnakes often are ambush predators, using stealth and speed to gain their meals. When they know their prey is onto them, they're likely to move on. When squirrels encounter snakes that don't have infrared sensors, such as gopher snakes, they still wag their tails, but they don't heat them up. 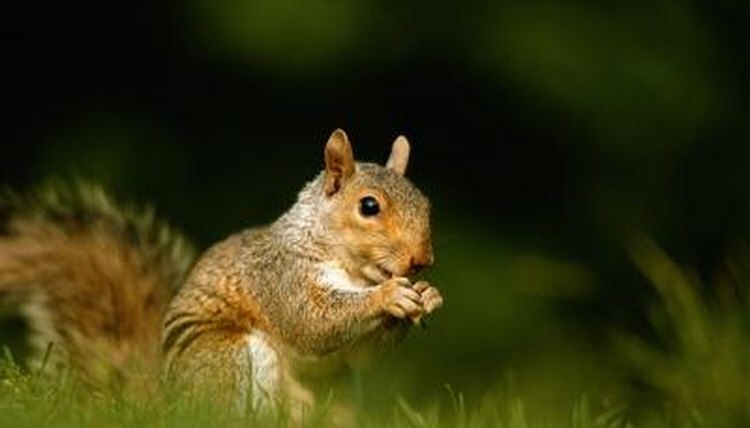 When squirrels find food items such as nuts or seeds, they don't particularly like to share. Some items they eat immediately, and some they store away for the cold winter months. Either way, they don't want other squirrels encroaching on their food sources. As they gather food, they often stop and wag their tails at other squirrels to warn them away. During breeding season, squirrels communicate in part by using their tails. When a squirrel sees another of the opposite gender, he's likely to wave his tail at her or make it shiver as a way to gain her attention. He alternates between approaching her slowly and pausing for some intricate tail movements. If she likes his tail dance, she might decide to mate with him. In general, squirrels tend to wag their tails when they are startled or alarmed. This signals to other squirrels, letting them know to be on their guard and look out for trouble. They often wag their tails when they're upset, such as if a person gets too close to some squirrel babies. Tail wags also let other squirrels know if they've encroached on someone else's territory. Territorial tail wagging could be followed by a squirrel fluffing up his tail -- that's a signal that he's feeling aggressive. Discovery Kids: Why Do Squirrels Have Bushy Tails? What Kinds of Squirrel Species Are There? What are a Rattlesnake's Predators? What Does It Mean When Mice Shake Their Tail? What Kind of Snake Has a Yellow Ring Around Its Neck? What Does a Harris's Antelope Squirrel Eat? Do Squirrels Make Any Noise? What Defenses Does the Chipmunk Use to Survive? Do Squirrels Really Know Where They Bury Their Food? What Do Chipmunks Do When in Danger?